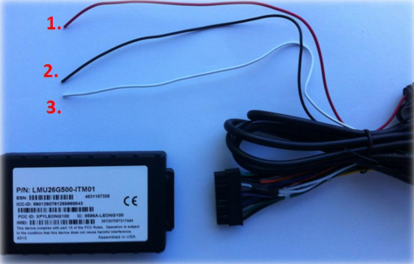 A 2630 wired device provides GPS tracking of the vehicle at a 60-second interval with the Engine On and a 60-minute interval with the Engine Off. Because the device wires directly to the vehicle, the Diagnostics feature is NOT available as the 2630 bypasses the vehicle’s onboard computer. Please make sure to keep track of which device goes into which vehicle, using the IMEI number you see on the white label. This number is a permanent ID code for the unit and cannot be changed. You don’t want to finish your installs and discover that you don’t know which unit is where! Your wired tracking device will require a 3-wire installation. Unless you have ordered additional components, this is everything that needs to be installed for it to report properly. This process should take about 20 minutes. If you aren’t comfortable doing the install yourself, a professional with background in vehicle wiring (for example, audio or alarm installation) should be able to put the unit in. The 2630 can be hidden within the dashboard, however, it should NOT be placed under metal, as this will interfere with the GPS signal to the orbiting satellites. Do not install the device in the engine compartment. When installing the 2630 make certain that the white label faces the sky. The unit should report within 20-30 minutes of installation. Running the vehicle engine can usually encourage the unit to report sooner. Ensure that the vehicle is outdoors and has a clear view of the sky (no roofs or overhangs). If the unit has been installed for longer than hour without a report, please contact our Support Team for assistance. If your Wired tracking device is reporting every 60 seconds, even when the vehicle engine is turned off, this indicates that is is wired ‘hot’. There is most likely an installation error regarding the Ignition wire (WHITE). Make sure this wire is receiving 12V when the engine is ON. When the engine is OFF, the device should be getting 0V. The presence of power on the wire is what tells the unit whether or not the engine is running and therefore what reporting interval to use.